Autumn is in the air and I absolutely love it! Our youngest, Sean, just celebrated his fourth birthday on the first day of autumn and we enjoyed a wonderful weekend in the mountains. It was his turn to be king and pick everything we did and ate. Needless to say he loved every minute of it all! Among all the wonderful things we did was a trip to the orchard to go apple picking. For the second year in a row we went to Sky Top Orchard and had so much fun. In addition to all the apple trees we went through the bamboo forest, saw all the animals, played on the playground and had apple cider donuts. What glorious fall fun! This entry was posted in Jams and Jellies and tagged breakfast, easy, gluten free, Spread on September 29, 2014 by Gretchen. The weather is FINALLY cooling off here. That means the highs are down to the low to mid 80s. The best part is the slightly cooler evenings and mornings. It is much more pleasant to be outside, the kids can play outside and I can get some garden work done. I managed to weed the entire garden and pull up the remaining tomato plants this morning. 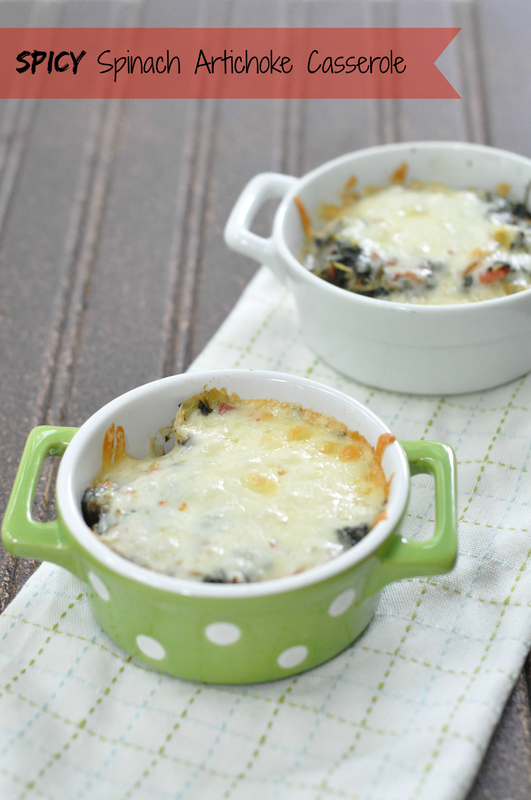 This entry was posted in vegetable Sides and tagged easy, gluten free, spicy, vegetarian on September 19, 2014 by Gretchen. Yesterday was my husband’s 40th birthday. Lucky him, I wasn’t even cruel in the slightest way! And no, it wasn’t because I fear what he will do to me, I already turned 40! We had a wonderful weekend. We had friends over Saturday night, went out for bagels the morning of his birthday, had tea and birthday cake in the afternoon with my parents, enjoyed cocktails on the porch (it was unusually cool for us) and had a wonderful crab cake dinner. 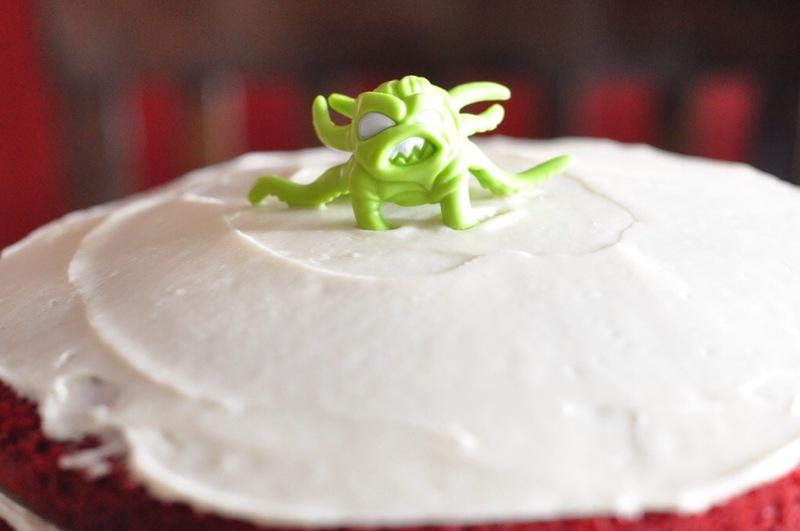 While I don’t have time to post a recipe with this, I simply had to include pictures of the cake. 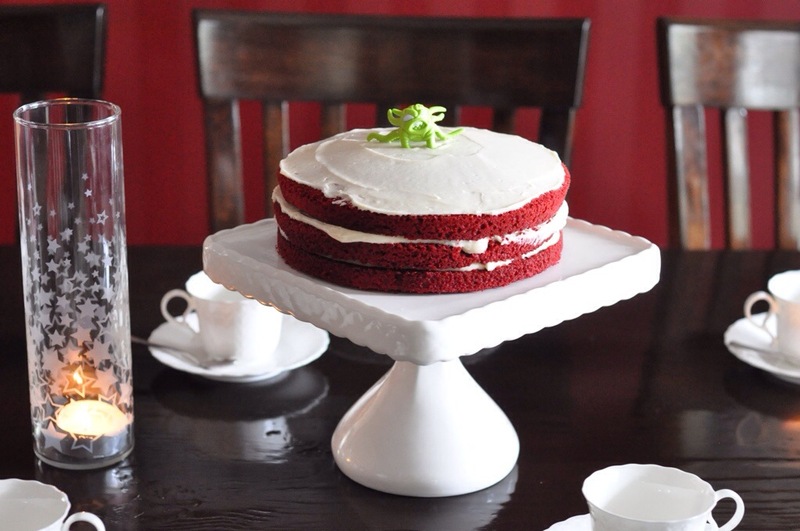 Josh requested red velvet with a cream cheese icing. Jack is the one who helped with the “decorating”. We originally talked about putting their skeleton Lego man on the top for a poke at how old Daddy is, but Jack changed his mind and put an alien toy on top instead. Sometimes I wonder what goes through his mind! 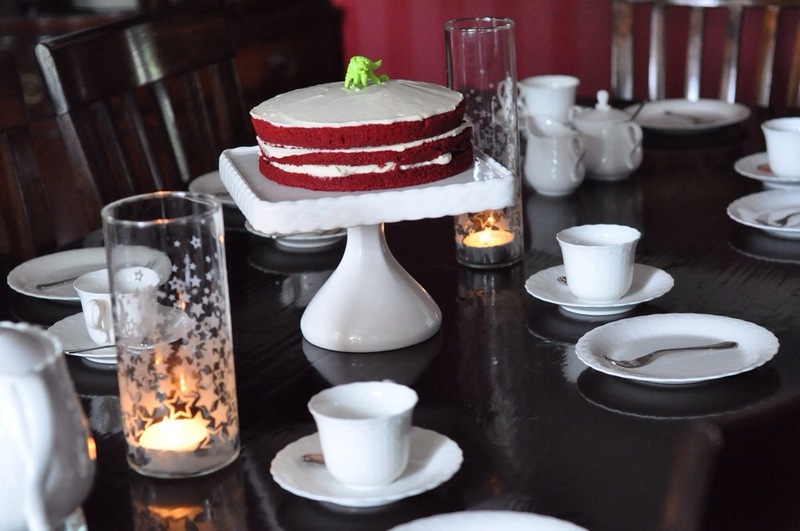 This entry was posted in Family Celebrations and tagged 40th birthday, red velvet cake on September 15, 2014 by Gretchen. 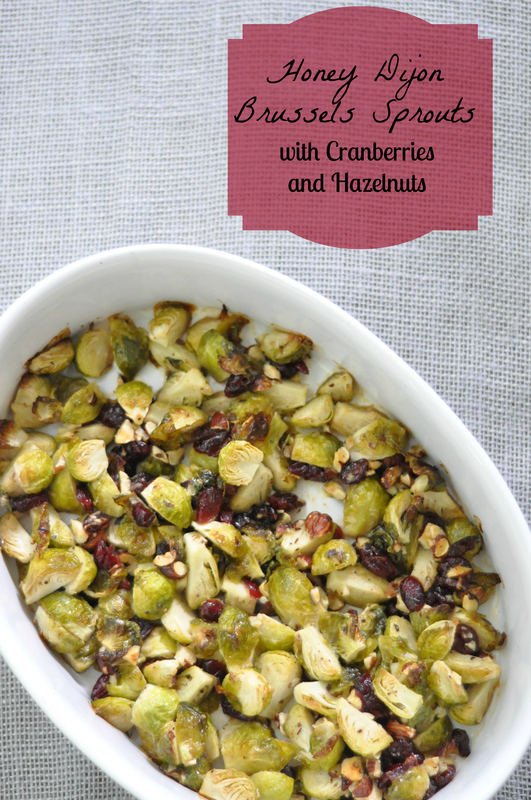 This entry was posted in Vegetable Sides and tagged brussels sprouts, dijon mustard, dried cranberries, easy, gluten free, hazelnuts, vegetarian on September 10, 2014 by Gretchen. I have accepted a challenge from the people over at Man Crates. They are a company that makes gifts ideal for men, though I know I wouldn’t mind some of them myself either. They have a variety of gift packages including themes for the griller, the athlete, the beer enthusiast and so many more options. The best part, the gifts are placed in a crate that the recipient has to pry open. No more boring gifts for the men in your life. The timing is right, my husband turns 40 later this month…a custom over the hill package is tempting! We say ‘no’ to ugly neckties, cologne samplers and executive trinkets. We don’t save wrapping paper, we don’t do ribbons. We ship bragworthy gifts for guys. Gifts that you can’t wait to arrive because you know the recipient will love opening them. Gifts that people gather round at the office, people following the sounds of wood being torn from wood by the included, laser-engraved crowbar. We are Man Crates, and we deliver awesome gifts for men. This entry was posted in Uncategorized and tagged blt pasta salad, blueberry smash, cookout, gift giving, gifts ideal for men, grilled peaches, grilling, lemon orzo salad with chickpeas, Man Crates, summer on September 3, 2014 by Gretchen. I am joining Celia’s party at Fig Jam and Lime Cordial again. What is in my kitchen this month? A little of everything I suppose! The latest additions are local products which are always fun. We spent this past long Labor Day weekend in the mountains with my mother in law. She lives in Kentucky and here is what she brought us…. 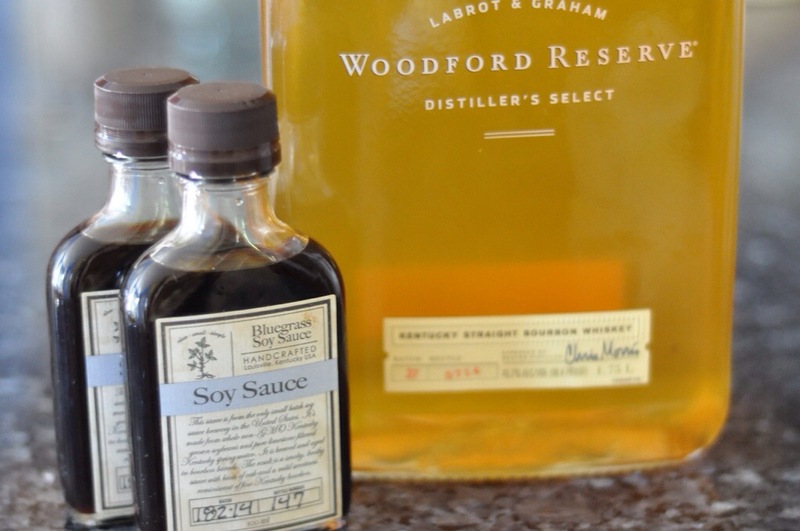 This entry was posted in In My Kitchen and tagged Bluegrass Soy Sauce, bourbon infused honey, infused balsamic vinegar, spaghetti squash on September 2, 2014 by Gretchen.